Every year, I try to recreate something from our wedding menu. The first year, I made our cake, the year after that filet mignon but I had never tried to make everything from appetizer to dessert before. When the opportunity for the Foodbuzz event appeared, I was immediately inspired to give it a try. My husband and I are both from northern New Jersey originally. We were used to weddings being big, splashy events. However, we wanted something smaller and more simple for our own nuptials and headed south to the Jersey shore for inspiration. I fell in love with the historic Allaire chapel and knew that was where we would have our ceremony. 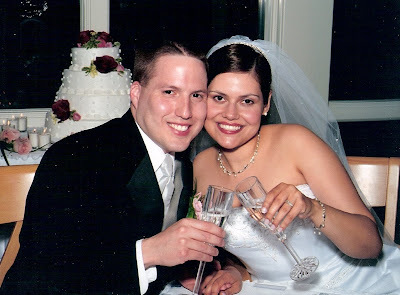 Then, I started looking at sites for our reception and found The River House in Brielle, NJ. The River House offers beautiful views of the Manasquan river and it's main dining room has gorgeous skylights that make the whole room glow. However, it was the food that ultimately sealed the deal for me. When we went for our tasting, my husband and I kept saying how great the food was and how it did not taste like anything from a banquet hall. These mini melon and prosciutto skewers were actually not on our reception menu. I had originally planned to make both mini crab cakes and asparagus, prosciutto with mozzarela in puff pastry. However, after sitting down and looking at the other items planned, I knew this would not work. Two heavy appetizers were going to be too much food for us. So, I decided to go with these light and no cook cuties. Our reception menu featured a simple mixed green salad like this a with champagne vinaigrette. I almost didn't make it for our dinner at home though. Having never bought champagne vinegar, I was in for a bit of sticker shock when I went to the grocery store. A small bottle was almost $12 -Yikes! However, since FoodBuzz was sponsoring this dinner, I went ahead and (gulp) bought the pricey stuff. My husband loved this dressing but I found the Dijon mustard flavor to be a bit strong. I'm so bummed that I didn't get a picture of this soup myself :( The above photo is courtesy of Recipe Tips. This soup was fantastic! It was creamy and so flavorful. 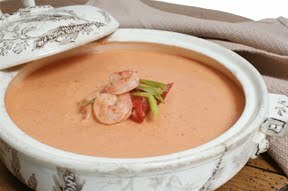 I had always thought shrimp bisque would be much more involved but this recipe was very straight forward (as are most of Ina's). I couldn't find seafood stock though, so I subbed chicken stock instead and it worked just fine. I was a little unsure about this recipe from Paula Deen. Filet mignon is such a tender and flavorful cut of meat that it really doesn't need much more that salt and pepper to make it taste mazing. Paula has these marinate for 4 hours in Italian dressing, wrapped in bacon and brushed with steak sauce and I was afraid that would be overkill. However, I am happy to report that these came out perfect! Thanks Paula!! Anyway, I was very happy to just have to deal with tails. I first steamed the lobsters (as seen above), then finished them off under the broiler with some garlic herb butter and fresh lemon juice. Delish! I loved these yukon gold whipped potatoes! The color and creamy texture makes this very simple recipe perfect for special ocasions. Plus, you can make them a day in advance (like I did), then just heat them up before serving which is a lifesaver when you are cooking multiple dishes. Our reception menu featured haricot verts as the other vegtable side dish. However, I could not find these at my local grocery store and I thought regular green beans would not be special enough for this meal. So, I decided on simple roasted asparagus. They were a perfect acompaniment to the filets and lobster. Our meal wouldn't be complete without wedding cake! Ours was a simple white cake with cannoli cream filling and buttercream frosting. To recreate this cake, I used Doris Greenspan's famous "perfect party cake" recipe. The cake came out light and tasty. I went with a simple ricotta recipe to make the cannoli filling but I wasn't crazy about about it. It didn't have that nice rich and creamy taste that I was hoping for :( The buttercream was made with butter and shortening....I know, I know...shortening? Kind of yuck, but I think it really helped the texture of the frosting. I liked how the cake tasted overall and was very pleased with myself for how it looked. I don't make cakes often, so it's still a challenge for to decorate cakes with icing but this one came out looking suprisingly good. Lastly, it was fun to recreate this meal and more fun to share it with my husband (happy anniversary Hon!) and kids. 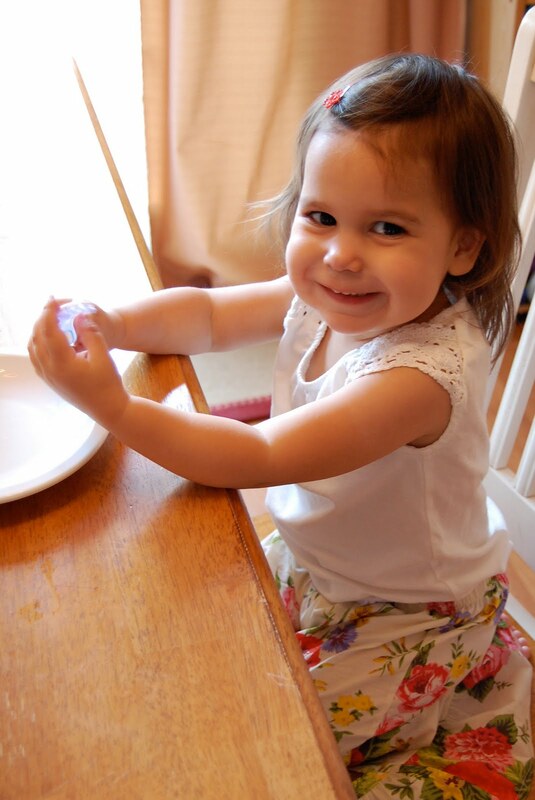 My daughter waiting patiently for cake.